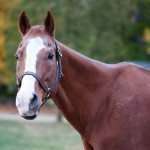 Description: Born in 1995, Bill is a handsome chestnut gelding who stands about 16 hands tall. He has a big white blaze and a little scar under his right eye. Personality: Bill is very sweet and a little shy. Sparky is his best friend, and they play hard in the turn-out paddock together. Bill is eager to please his rider, does not care for crossties and much prefers to be groomed in his stall. History: Bill joined our NCMT family in 2012 from a local barn where he was a school horse. Prior to that, he did hunter paces and worked on beach trail rides.